is ideal for events, sightseeing tour, city tour and also Singapore airport transfer as it can accommodate up to 13 adult passengers with hand carry luggage and up to 9 adult passengers with about 8 to 12 large travel luggage. Booking a 13 seater mini bus with us is simple and stress-free. The Toyota Hiace 13 Seated Minibus is also known as passenger van, commuter van, and people carrier. This type of minibuses or mini coaches is one of the most popular form of transportation among tourist as well as the locals when travelling in a larger group in Singapore and Malaysia. Due its high roof and ample space with large boot compartments hiring the 13 seater Toyota Hiace High roof mini bus has always been the favorite choice for events organizers and travelers who want comfort and space. 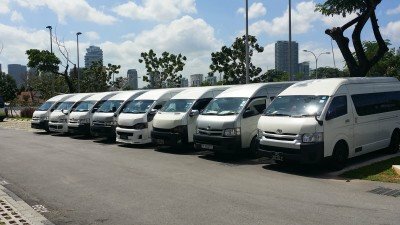 When travelling around Singapore and Malaysia in larger groups it is not only economical to rent our 13 seated minibus with a driver, but it also provides convenient because our mini bus booking service saves you from the hassle of waiting and flagging 3 to 4 taxicabs on the streets and avoid you paying more. If you are looking to book a smaller 6 seated and 7 seated mini bus click here. Check our maxi cab and mini bus charter rates here. By travelling in our clean, spacious and comfortable mini bus as a group, you will also experience the value of staying and enjoying your travel together. As the family, friends, business associates and your clients will be able to converse and commute while travelling in the same spacious minibus making the journey more satisfactory and beneficial. Don’t wait ! Call us at +65 9150 1948 or +65 90280671 Click here for Singapore mini bus charter online booking!